Born in Glasgow, the son of a property valuator and nephew of architect James Thomson of Baird & Thomson, with whom he trained from 1876 to 1881. After leaving Baird & Thomson in 1886, he practiced as a property valuator with his father and brother and set up his architectural practice in 1899, at 93 Hope Street. Moving his office to 115 Wellington Street in 1901, he remained there until 1913, when he moved to 187a West George Street. His home address at this time was 4 West Garden Street. It was in the early years of the twentieth century that he produced his most important buildings; working for the Glasgow Savings Bank on two of its grandest branches in the city, and also in producing some of Glasgow�s earliest cinemas. His bank buildings at Shawlands Cross (1905-6) and 101-3 New City Road (1910) are distinguished by their Baroque detailing, including domed corners and elaborate sculpture and carverwork. The New City Road branch is the more splendid of the two, with pairs of putti; allegorical figures of Shipbuilding and Commerce; a profusion of fruity garlands; escutcheons; carved keystones; and a magnificent Royal Arms above its main door. The Shawlands branch, too, has a splendid armorial group above its entrance, but the rest of the building�s ornament is restricted to non-figurative carverwork which, like all of the sculpture on Duff�s buildings, is by an unidentified sculptor. His earliest use of an elaborate sculpture programme was at 74 York Street; a tall Baroque commercial block dated 1901, which features amongst its ornament a half-length figure of St. Mungo; a heraldic shield; grotesque masks; and a bronze, Egyptian-style female head above its entrance. His only other building with a notable display of sculpture was the La Scala cinema (now Waterstone's), 147-59 Sauchiehall Street, which was designed in collaboration with the noted cinema architect, John McKissack (1908-12), and which originally featured reliefs of two full-length, female Classical figures in the spandrels of its arched entrance, which were removed in the 1950s-80s, as a modernizing touch. Exceptionally well modelled, and unusual in subject, the figures included one exquisitely carved maiden enthusiastically pointing a camera at her companion across the arch, with a rising, radiant sun lighting the scene for her. 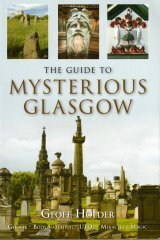 A particularly good, detailed photograph of the figures on the Virtual Mitchell Library Website (Cinemas: record number C3050, October 1954), reveals that they were amongst the very best examples of architectural sculpture of the period in Glasgow, and that their subsequent removal was a lamentable and unnecessary act of vandalism which deprived the building of its most noteworthy feature. The Gothic Ruchill Parish Church, Ruchill Street (1903-5); the George Hotel, 235-45 Buchanan Street, which features a tiny shield bearing the Glasgow Arms above its main door (1907); and the Great Eastern Hotel, Duke Street, featuring two cherub heads flanking its entrance (1907-9, formerly Alexander�s Mill, of 1844). In 1921, he entered into partnership with Percival Cairns (d. 1926), his former assistant, and from 1927 he practiced on his own until his death in 1934. Elected an FRIBA , 1906, he also served as a Justice of the Peace. Duff lived at 17 Falkland Mansions, Hyndland, with his wife, from 1921, and after his death on 24 February, 1934, he was buried beside his parents in the Necropolis. His monument stands to the right of the monument to another well-known Glasgow architect, James Thomson, in the Epsilon section, lair no. 445. He left an estate valued at �21, 313.7s.1d.